Down manager Jim McCorry has included a number of new faces in his squad for the forthcoming McKenna Cup campaign. 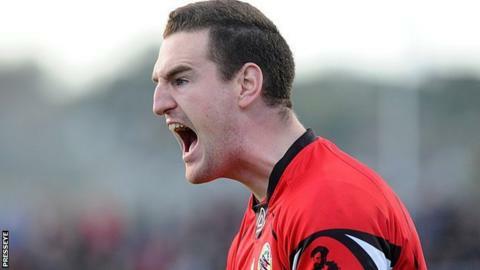 With regular goalkeeper Brendan McVeigh retiring, Stephen Kane of Kilcoo and Kieran Gordon of Loughinisland get their chance to fill his gloves. New faces include defenders Gerard Collins and Conall McGovern, Cathal Crilly and Chris and Danny McKay. Kevin Anderson, Luke Howard, Malachy Magee and Packie Downey are back in the squad but Niall McParland is injured. Benny Coulter has also retired from inter-county duty but experience comes in the form of Kevin McKernan, Conor Laverty, Conor Maginn and Conor Garvey. Warrenpoint's continuing involvement in the All-Ireland intermediate club series means that McCorry must work without their contingent, Ryan McAleenan, Ryan Boyle and Ryan Mallon. Notable absentees from last year's McKenna panel selected by previous boss James McCartan include Liam Doyle, Kalum King, Conleth O'Hare, Daniel MCCartan and Declan Rooney. Aidan Carr is getting married on 4 January, while Mark Poland is on honeymoon in the early weeks of the new year. Among the other players preparing to sit out the campaign are Martin Clarke, Caolan Mooney, Dan Gordon, James McClean, Barry O'Hagan, Danny Savage and the Johnston brothers, Jerome and Ryan. The Mournemen will face Cavan, Monaghan and Jordanstown in their group games, starting with a clash against the Breffnimen on Sunday 4 January. Cavan manager Terry Hyland has named UUJ student Killian Clarke in his squad for the competition but acknowledges that the talented defender might still play for his university. Sunday's trip to Pairc Esler will mark Ronan Flanagan's return to county football, the Castleharan man having missed an entire year recovering from cancer. Alan Clarke and David Givney are taking a break, Cian Mackey is injured, while Niall McDermott and Conor Moyna are on duty with their respective colleges. The five newcomers in the squad are Christopher Conroy, James Morris, Paul Smith, David Wright and Enda Hession. Meanwhile Antrim manager Frank Fitzsimons has given a number of experienced players a rest by naming a youthful panel for the season curtain-raiser. Despite being without nine men because of university commitments, plus O'Donovan Rossa duo Christopher McGuinness and Michael Armstrong, Fitzsimons has named just a handful of regulars in his 26-man squad. Niall McKeever, Ryan Murray, Ronan McGrady, Niall Delargy, Paddy McBride, Matt Fitzpatrick, Ruairi Wilson and Johnston brothers Martin and Ricky, are all university-tied for the pre-season competition. Fitzsimons has included seven men who featured in last year's Championship campaign under Liam Bradley and he also welcomes back Chris Kerr and CJ McGourty, who left the squad last spring. Powerful Cargin attacker Michael Magill is also reinstated while Tony Scullion is named, but will only return to training this week. The Saffrons begin their campaign against St Mary's on Sunday, with games against Armagh and Tyrone to follow.